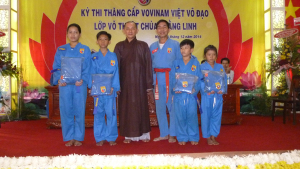 On January 14th 2015, 118 Vovinam martial hormone temple Hoang Linh, An Nhon Tay Commune, Cu Chi District, Ho Chi Minh City has promoted competition blue belts. In order to create a healthy playground for the youth, high school, elementary school in the area, with the support of government, mass An Nhon Tay, Sector Sport Vietnam Cu Chi and Martial Arts Association directed by Ho Chi Minh City, Hoang Linh pagoda held free workshops vovinam from mid May 2015. Typically, attracting about 170-180 class regularly practiced martial. Not only that, in parallel with the martial class has a class Ayurvedic Budo Vietnam with about 20 parents and Buddhists participate. Venerable Thich Tinh Tam – chaired temple Hoang Linh – glad adds: “In the spirit of volunteering, Master Nguyen Chanh Tu, Nguyen Hoai Van Coach also is not afraid to remote roads from District 11 HCMC formation up here training classes per week 3 sessions (from 17 hours to 18 hours and 30) without receiving remuneration. So that Vovinam martial arts classes here were conducted smoothly and today we are happy to organize examinations first rank “. Tran Trung Nghia – People’s Committee Chairman Nguyen Van Teo and – Chairman of the Fatherland Front Committee of An Nhon Tay, organizing free workshops vovinam temple Hoang Linh is a good run away, beautiful religion, helping the youth, students in social practice and moral health.